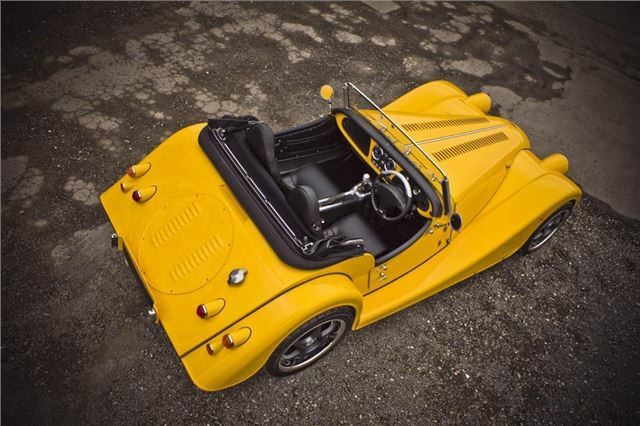 Electrically powered Morgan based on the Plus 8, has a 94bhp electric motor with 300Nm torque. At the moment just a concept. Morgan unveiled an electrically powered model at the 2012 Geneva Motor Show. Called the Plus E it's fitted with a 94bhp electric motor with 300Nm of torque which should give it a 0-62mph time of around 6.0 seconds and a maximum range of 120 miles. Based on a tweaked version of the lightweight chassis of the new Plus 8 (which incidentally gets a BMW V8 engine), the Plus E has an updated version of the traditional Morgan body shape. A working prototype, it's been built to gauge customer reaction and if there's sufficient demand, the Plus E will become a production reality. Unlike most electric cars, the Plus E comes with manual gearbox. Morgan says the five-speed transmission helps increase the range of the car and driver involvement, promising that it will be 'a fantastic car to drive'. The electric motor is provided by British firm Zytek, which provides the power for several electric cars including the Smart ForTwo electric drive as well as a variety of racing cars. The Plus E is rear wheel drive and comes with a conventional clutch but as the motor deliver torque from a standstill, you don't have to press the clutch down when you stop and pulling away, acting like an automatic. There are actually two concept vehicles. One has the five-speed gearbox with Li-ion batteries and will be used for preliminary engineering assessment while the other will be closer to a production specification, with alternative battery technologies and possibly a sequential gearbox.